As I mentioned last week I’d been to Iceland once before, but really nothing could of prepared me for the sheer spectacle that we discovered during our visit this past week. Each of the adventures we experienced was so different to the others that its impossible to choose just one as my favourite. At the end of each day over dinner whenever the three of us travel together we choose what was the best thing that we each experienced that day, sometimes the same, sometimes different but always entertaining reliving our day. I think we all agreed that the day at the Blue Lagoon was very special and an experience we’ll never forget. It truly was a full day at the spa experience, thermal springs, face masks – both silica and algae, lunch at the restaurant in our robes, then an afternoon water massage and for me a nap in the sunshine. The extra bonus is that instead of doing it alone as I often do I got to share this wonderful experience with Zach and Sami. Very memorable indeed! Zach was going to find refuge in the chill atmosphere of the Reykjavik coffee shop scene and spend the day writing and researching a politics paper he had coming up. Meanwhile Sam and I headed out of the city and initially found our drive very slippery as it had snowed heavily the night before and the roads were thick with new snow especially as we got into the steep mountains east of the city. The car I’d rented was a Subaru 4×4 which was perfect in the heavy driving conditions, albeit a few tricky moments on the narrow roads…but no real issues. 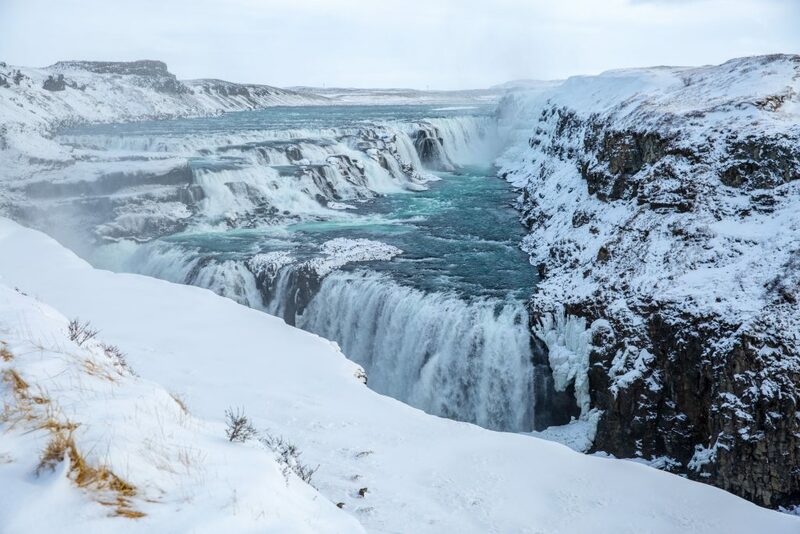 There a few different routes you can take from Reykjavik to the waterfalls at Gulfoss and each has its own charm, we ended up taking two different routes there and back just to check out the scenery. Our drive was through a winter wonderland, with the countryside being very “Game of Thrones” of you know what I mean. We also noted that there were lots of places along the way where steam vents were billowing clouds of super heated air deep from within the earth into the atmosphere, mostly in the middle of a barren farmers field. Very cool! To get to Gulfoss you have to pass by the Geysir area, although when we got there noticed a few newly arrived tour buses disgorging their cargo so opted to keep going onto the falls before stopping there on our way back. Pulling into the small carpark by the falls, you could hear the roar of the falls from some 500 meters away, and as you got closer it became almost deafening such was the power and volume of water careening over the lava plates deep into the crevasse created by centuries of water. To be truthful, after the waterfalls the Geysir was a bit of an anticlimax, although cool to see the geysir erupt with scalding hot water every 6-10 minutes it was the waiting about that took its toll. Instead, Sami decided that we should go on a Whale Watching cruise instead on the second to last day of our trip, everything started off well enough as the harbour was calm with little wind and so we wrongly assumed that the 3 hour cruise would be an easy one. The briefing by the ships Purser should have been a warning…he suggested that everyone take sea sickness tablets just to be safe. Zach suffers from motion sickness as do I, so we got some tablets before the boat left the dock. Sami felt that because she’d never been sea sick and had been on boats many times in the ocean that she was going to be fine – famous last words I can tell you! As we breached the inner harbour and swung the nose of the boat into the bay the swell got noticeably larger, and as we turned into the wind and got outside the protection of the mountains around the city itself the wind was exceptionally strong which made the swell at least 4-6 feet and of course you know what that does to a smallish tour boat. I know it doesn’t sound much, but once the boat got into open water the deck was pitching pretty good, Zach was by this time completely green and now lying down in the main cabin bench trying to keep it together, I was outside in the fresh air trying to focus on the horizon and landfall whilst Sam was back and forth between the two. However, after about an hour and we were still heading out to sea that Sam started to feel the first pangs of sea sickness begin to develop. We made it to the feeding grounds where normally you’d find whales and dolphins and as the boat slowed its engines the boat really took on the steady up and down of a rollercoaster. After what seemed like an eternity of chugging around in a circle the captain decided it was time to begin heading back and once we running with the swell the boat calmed down considerably, however by this time the damage was done. Two sea sick teens is not a fun way to start the day! I take my hat off to Zach for being such a trooper, given that he was already prone to sea sickness he still agreed to come with us – good on ya mate! And hoping that Sam won’t be put off future sea born adventures because of this one episode. I guess that’s what a life of adventures is made of…putting yourself out there. Feel blessed to have two sturdy and self reliant adventurers help me explore the world! 0 Comments on "My exotic beauty"